The Institute of Technology and Life Sciences in Poland has completed an investment in an in-storage slurry acidification system. The Institute now conducts trials and experiments and prepares a demonstration event to be held in mid-June. The Institute plans to grab the attention of those involved in agri-environmental activities in Poland. The Institute of Technology and Life Sciences is the first to introduce an in-storage slurry acidification system in Poland. SATs, however, are not completely unfamiliar in Polish agriculture practices, as an investment in in-house slurry acidification began a couple of years ago in the northern part of the country. The Institute of Technology and Life Sciences bought the complete acidification system from the Danish company ØRUM. The in-storage slurry acidification system consists of a slurry mixer and an acid doser and it mixes the sulfuric acid directly into the slurry of the storage tanks before spreading. “To run a safe acidification process using the ØRUM system you have to have an acid tank with a special pump placed on a truck. The acid tank used during the trials belongs to the Danish company FaurFarm, which cooperates with ØRUM,” says Kinga Borek from the Institute of Technology and Life Sciences. The institute started acidification experiments on a small scale in 2016 with field trials on plots. 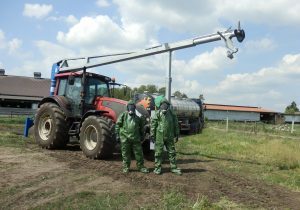 Having completed the investment in May this year, the Institute started doing in-storage acidification experiments with the acquired ØRUM equipment at Biebrza Research Farm, some three hours northeast of Warsaw. An inauguration event was held in mid-May at the Biebrza Research Farm.The event started with a seminar and continued with a demonstration of trials. ”We acidified 1000 cubic metres of slurry for field experiments using both slurry stored in concrete tanks and in a lagoon. During our acidification experiments we will be taking samples for further laboratory testing”, says Jan Barwicki, Associate Professor at the Institute of Technology and Life Sciences. The seminar hosted an audience consisting of farmers, representatives from the agriculture advisory service, agriculture press, scientists and representatives from the Ministry of Agriculture. The participants took part in active dialogue and the organizers were hopeful of slurry acidification becoming an interesting topic in agriculture activity in Poland. The Institute has worked closely with the other Polish project partner, the Agricultural Advisory Centre on every aspect of the slurry acidification project. The Agricultural Advisory Centre has good connections with farmers and on 12 June the Agricultural Advisory Centre brought a group of 50 farmers to the experimental farm in Biebrza for demonstrations and a seminar. The Institute has also published a video about the use of in-storage slurry acidification technology. It can be viewed on YouTube (in Polish only).